I bought 15cm stainless steel rigging screws (also known as bottle screws) on EBay, by far the cheapest source and much less than you’d pay a marine or balustrading supplier, and they arrived within the week. 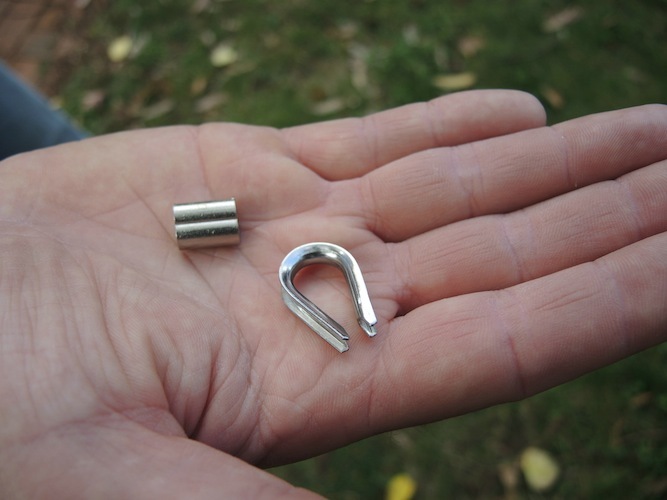 Rigging screws can be hook, eye, hook – eye or jaw-jaw, as well as a couple other combinations. I chose jaw-jaw because they look neater than the hooks and offer the most flexibility for installation. 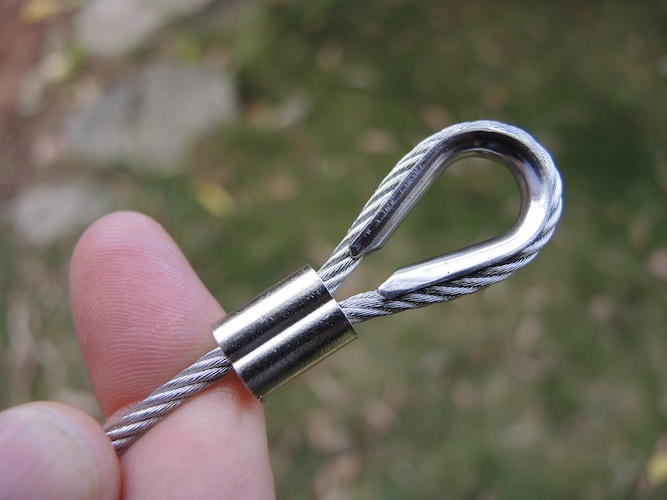 I chose 3mm stainless steel rope, available from marine and stainless steel suppliers or online, plus 3mm thimbles (the U-shaped guides that the wire bends around) and swages (the little tube that you squash together around the wire to lock it, also called ferrules). These are all expensive, but I have a friend who works in the industry, so got everything at a reasonable price. 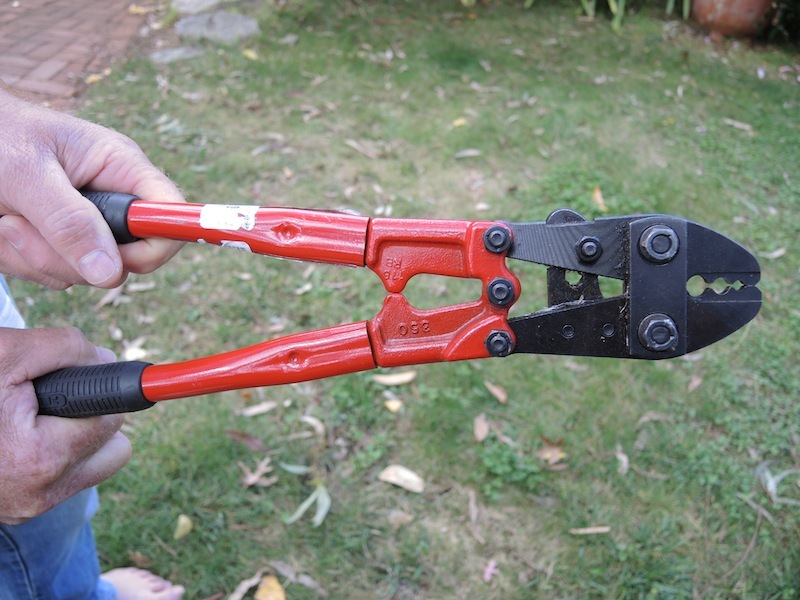 As well, I borrowed his swaging tool (most places that sell the rope hire out swaging tools for a few bucks). 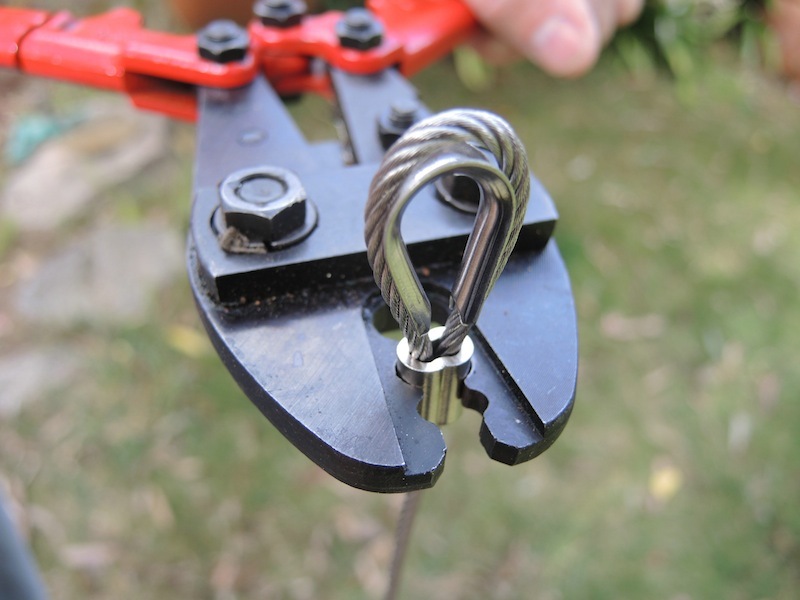 Someone who’s good at measuring and experienced in construction would measure up everything and do all the swaging in a workshop, but I’m not confident in that department so I did everything in the garden, with a vise on the ground for half of the swages. I found I could operate the tool if it was in the vise with extra leverage, but simply wasn’t strong enough to close the tool in situ with the eyelets in the posts, so Geoff did all those. We took out the highest eyelets because, although it was time-consuming unscrewing them and then screwing them back in, it was easier than using the swaging tool at that height. Here is a video showing how to hand swage. Oh dear… so much for my brain surgery comment. When I watched that video, I discovered I should have done two crimps, not one, so we have to borrow the tool again and do them all once more; apparently three times is ideal for 3mm stainless rope but that’s just too much effort! 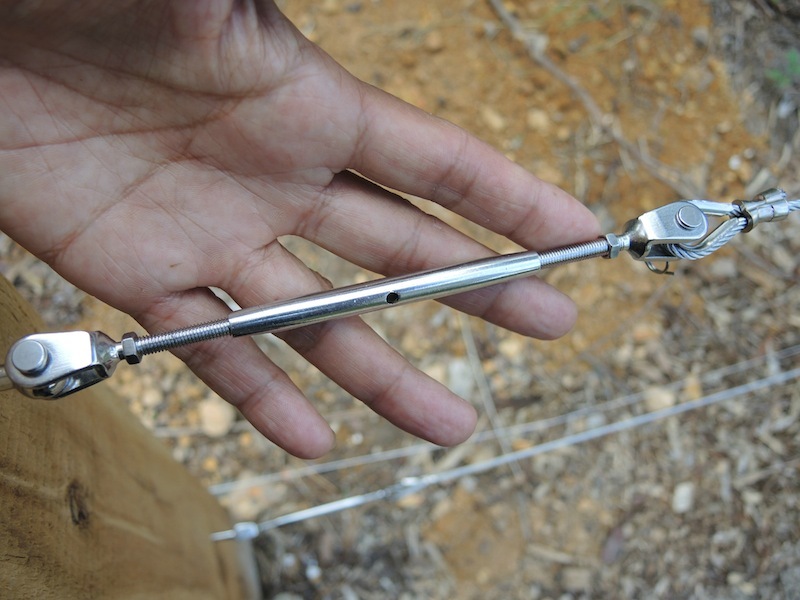 The rigging screw is at one end of each length. I unscrew it as far as possible minus a few turns before it comes undone completely, and then attach it to the eyelet. I then measure the distance between the jaw, and the eyelet at the other end of the wire, plus a few centimetres to allow for the doubling up of the swage at either end. Geoff swages around the eyelet with me helping (you really need two people if you’re doing this in situ, one to hold the swage and feed through the wire, the other to hold the tool), then during the week I swaged the other ends with the swaging tool held in the vise. 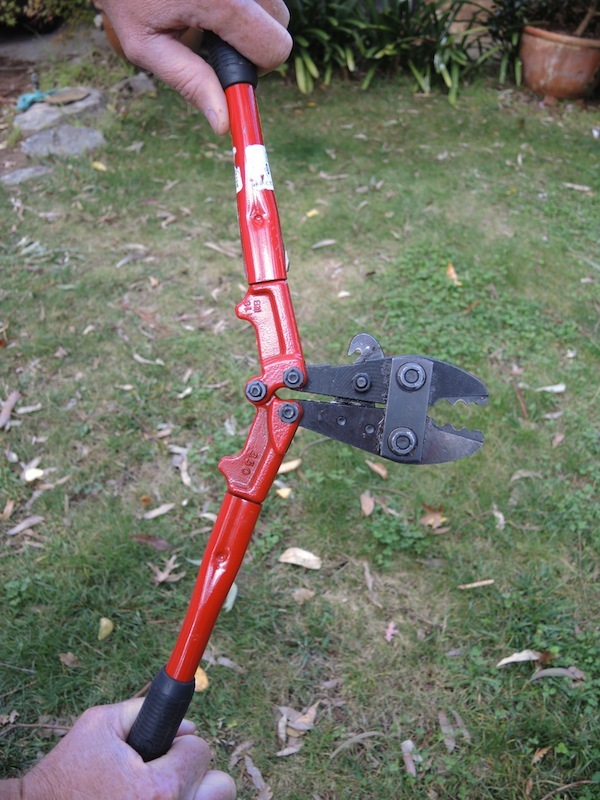 The swaging tool has a wire cutter on the side. The process was time consuming but not ridiculously so, and the two of us finished the whole job in about a day and a half, spread over three days. Plus the extra half a day next weekend for doing the extra crimps, it seems! Oh well, just as well I researched the process more thoroughly for this blog than I did for the actual job! 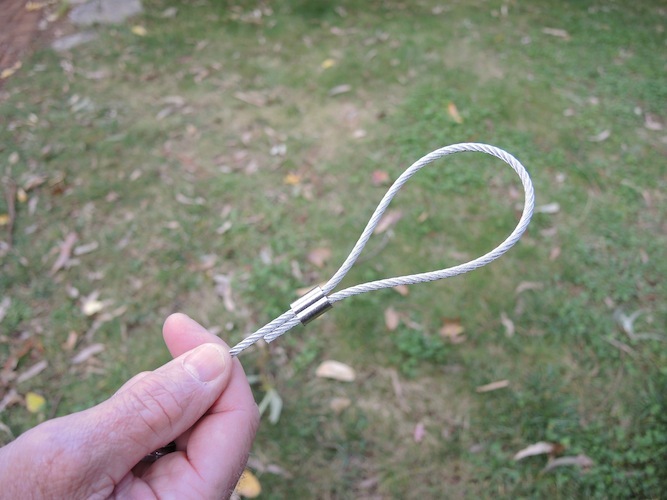 The wiring is the same throughout the garden, except for the bramble fruit, which are double wires, one on each side of the post. Next blog the fun part –training the berries! Hey great work Helen. We are about to undertake the same job at our community garden in Epping Vic. We have the posts in. Going by your blog, each wire run would have 1 x 15cm rigging screw; 2 x thimble; 2 x swages; 2 eyelets on end posts; 3mm wire. Do you think I have it correct? Will have a look around you site. Cheers. Yes, that’s all correct Of course, you don’t need to use these materials – you can use fencing wire and a strainer instead – cheaper and just as durable, but with a different visual aesthetic. You could ask your local community to see if any work with stainless steel – they may have access to materials at a cheaper price, and/or experience in swaging etc. The rigging screws can be undone easily, and would be expensive to replace – might this be an issue in your environment? Allen Gilbert’s book “espalier” is an excellent resource for Oz gardeners and covers every possible fruit that can be espaliered, as well as tips for ornamentals; I also have a blog on bramblefruit that should appear any day now. Later I’ll post about my trees, which are in the early stages of training. Finally, the Rare Fruit Society has many highly experienced and enthusiastic members who may be able to help you in your local region. Good luck! I’m in Brisbane and wondered if you give me any advice on creating a belgian fence? I have a 16 foot long trellis set up for 8 plants (holes are dug) and I’ve planted 2 avocados, plan to plant 2 more and in the other four i wanted to plant apples, so i wondered if apples and avocados will worked together? I checked out the soil ph and nutrients for both and they’re needs seem quite similar I just wondered if there’s anything i should be wary of? Does one grow much faster than the other or something like that, or is one greedier than the other with the nutrients? I dunno? Anyway, any info you could give me would be great. I’m sorry, Eddie, only just saw this post, but I see that Catherine has answered, and I agree 100% with her reply! Hi Eddie – Sorry – Helen is away trekking at the moment. Apples need cold winters to form fruit and even the low chill varieties like Dorsett Golden would struggle in Brisbane. They’d certainly be no match for the vigour of an avocado in your subtropical climate. You’d be better off pairing your avos with something else that likes the same climate, like mango. Thank you for this very detailed post – I think it’s the most comprehensive one out there. I am now putting together a shopping list based off your list, but I can’t seem to find 3 mm stainless steel wire anywhere. Where did you find yours? Thank you! Thanks Valentina. Not sure where you are in Australia (or if you’re somewhere else in the world altogether!) but I found stainless wire at a boating/marine supplier. I even got some of it cheaply as it was the end of a roll!